Practicing the Dhamma-vinaya in the context of a full-blown lay life. I am a father of three and husband living and working in NYC. I (attempt to) maintain a daily practice of formal sitting and walking meditation, pujas and sutta reading/chanting. In general, I try to maintain the the thread of the brahmaviharas throughout most of my posts as they form the core of my practice but, since this is my practice journal, I do at times stray from the cattari brahmavihara (the Four Divine Abidings). I hope that this blog will be of benefit to anyone who should stumble across it. If you would like to send me an email please do so at cattari.brahmavihara@gmail.com. Every good blessing! This is truly an amazing work. Nowaday people like you are very less and I’m really greateful and thankful on behalf all all buddhists around the world. Please keep up the good work. THERUWAN SARANA WEWA! nice, May Buddha bless you. Thanks for spreading the message of Buddha. Thank you for spreading the words of Bhudda. I to am working husband and father in a big city, London in my case. A good run for me would be 15 mins anapanasati 5-10 times a week. You serve as an encouragement and inspiration to us all, I hope you have support from others as well. Hello – I hope you don’t mind me writing this here, but I’m hoping you can help me… this isn’t spam, I promise! My name is Richard J. Bartlett and I have my own blog on WordPress, The Last Song I Heard – http://thelastsongiheard.wordpress.com – which I predominantly write for my son. I’m in the process of writing a book about personal beliefs (or lack, thereof) and was wondering if you’d be interested in contributing. I’m trying to get viewpoints from a broad range of people, representing a broad range of beliefs, including agnostics and atheists. My goal is for the reader to be presented with new and thought-provoking ideas about our place in the universe and, hopefully, to find some common ground that between the different beliefs. I hope you can contribute – I’d love to read your responses! I’m not sure what you’re looking for but I’m game. Let me know and be well! I’m glad to have found your blog, I follow the Mahayana lineage, so it will allow me to learn from the Way of the Elders (Theravada). Putting the Buddha’s teachings into practice into todays fast paced world is something I have to work at. May you always be my teacher. Sorry for the delay. Thank you for your kindness! It is always a blessing to meet fellow Dhamma-farers. Be well! I just dropped by to say thank you for following http://www.postsofhypnoticsuggestion.wordpress.com, It’s much appreciated. I’m honored by your comments. It is from bhikkhunis like yourself that I continually find inspiration. Please let me know if you ever need anything and I hope to hear from you again. Mettaya! Your blog is a constant source of inspiration for me ever since I found it. I wish I could write to you a few personal thoughts but I could not find an email button. If I am asking too much, please ignore my request. I am grateful for all that you share! Thank You for your kind words and for inspiring me to continue this blogging practice. Please email me at cattari.brahmavihara@gmail.com if you’d like. Every good blessing to you! Very inspiring. May the Noble Triple Gem bless you! Much merits for the useful links and information. Thanks for the compliment. Your blog’s not so shabby either. Take care! Let me first congratulate you for a useful and meaningful blog. The teaching of Lord Buddha is for practice and not for study. I am a Sri Lankan Buddhist and since my retirement about 10 years ago and have devoted myself to both practice and study. The study relate mainly to study of Pali original sources. Today is Poya-day here. 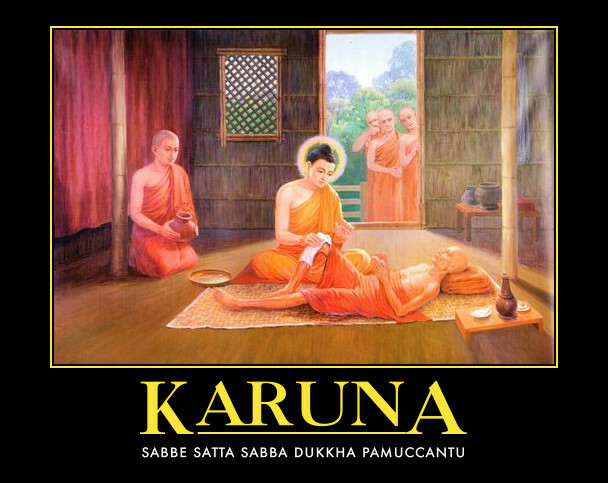 I am observing Uposatha today. While searching for some Dhamma-topic I came across this site. My mood was the Uposatha mood and wrote this e-m. I am not sure whether writing in this fashion is proper. If it is inappropriate please forgive me. However, if you wish me to write on some topic from the perspective of a tradition that has existed for over 2300 years, i am glad to do. Thank you for your comments. I would be honored to have you share anything you would like about the poya days. I tend to file the Thai Dhammyut sect dates for the Uposatha but the practice is the same. Sukhi hotu! It’s an inspiration to know that there are those like yourself practicing the Dhamma in accordance to the Dhamma. Sadhu Sadhu Sadhu! The mud, the lotus and the pale golden blue. The Knowledge is Provisions from Allah, May Allah guide us and strength our Iman & Taqwa. Ameen.